Anastasiya had just completed her Doctorate of Musical Arts at the University of Minnesota in Clarinet Performance. Prior to her DMA studies she also completed her Master’s at the University of Minnesota and received her Bachelor Degree at Grand Valley State University in Clarinet Performance. Born in Ukraine, she attended a music school from a young age. She moved with her family to Siberia where she studied clarinet with her father, Sergiy Nizkodub at the College of Arts in Khanty-Mansiysk. She started to take piano lessons at the age of 8 and continued through first year of her Bachelor. She is been teaching clarinet and piano since finishing her Bachelor, as well as also occasionally accompanying her clarinet students in lessons and at their performances on a recital. During past seasons she performed with Minnesota Fringe Opera, Mankato Symphony, Metropolitan Symphony and North Star Winds as a clarinetist. She had also performed solo and chamber music in the concerts featuring the Russian composers with Denis Evstuhin and Helen Chung. In addition to performing Ms. Nyzkodub worked as a teaching assistant for the Music Theory and Ear-Training Department at the University of Minnesota. She was a semi-finalist in William Byrd Young Artist Competition in 2017 and Received a First Prize at the Thursday Musical Young Artist Competition in 2015. 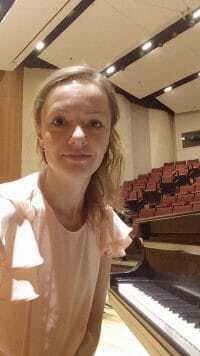 She is also a member of the Sonora Ensemble whose main focus is to perform and promote music of the prominent Polish composers in colleges across Minnesota.